Today is the BEST Friday, because it is my sweet boy’s birthday! Every year I find myself more and more in disbelief of how quickly time flies. On one hand it feels like he has been in our lives forever, and on the other I still can remember the day he was born like it was yesterday. We feel so lucky every day that this precious, kind, sweet boy is ours. 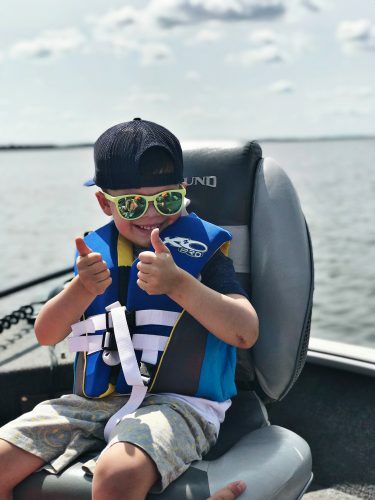 I took off work today to spend time with him and get things ready for his birthday party this evening, but before we tackle a day all about our boy, let’s dive into some Friday Favorites! Oh. My. Gosh. If you have Prime Video, RUN and watch this show immediately. You guys, it is so good. We are absolutely hooked, it has been the perfect show to get us through the summer slump with no shows to watch. There are two seasons on Prime Video right now, and Season 3 comes out in October! I am guessing we will finish watching in the next few days; trust me when I say that it is SO GOOD. 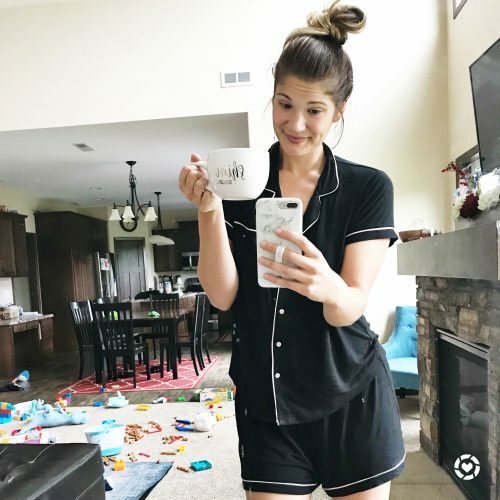 I will be honest, I am a tank top and gym shorts kind of girl when it comes to pajamas. But I had been seeing these around and couldn’t resist grabbing them. I went to the store because they were sold out online (but have since been restocked!) I was fully prepared to pay full price (because they are SO soft and cozy) but was so surprised when they rang up for only $5.98! There is just nothing I love more than getting something on sale when I had no idea it was on sale. This option is pricier, but is park of the Nordstrom Sale through the weekend and they have great reviews! I shared them last week as well, but these tops have been my most clicked and purchased items these past few weeks! They are such a great item for the price, and the fact that you can snag them on Amazon Prime with free shipping and returns!? You just cannot beat it. If you have ever wanted the UO option, you definitely need to snag one of these! Mike grabbed this floatie on a whim the other week, and we brought it up to the lake last weekend. And itw as the best $5 ever spent! The water gun feeds through the bottom right out of the lake, and Lincoln was spraying us nonstop. The boys had SO much fun riding on it, and Mike kept launching Lincoln in the air like he was flying; it was so cute! 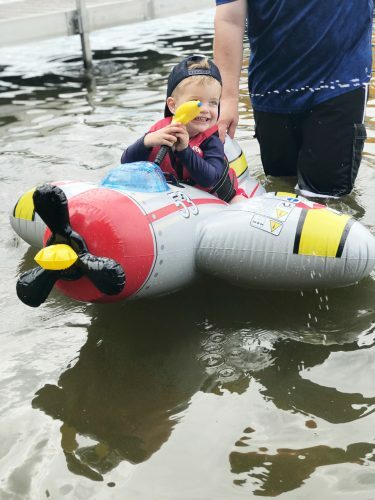 Lincoln has been pretty timid when it comes to going in the lake, but once he got on this thing we could barely get him out of the water! 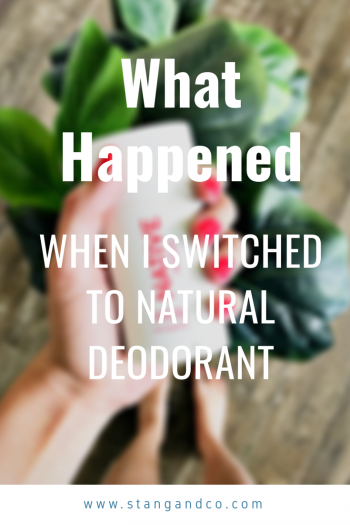 Did you catch my post earlier this week on what to expect when switching to natural deodorant? I started using Native deodorant a few months ago, and was sold immediately! Having tried out other natural deodorant brands, this is far and away the best smelling and the one that works the most! Head here to read the full post on how natural deodorant changes your body! I hope you all have the best weekend! We are looking forward to spoiling our big FOUR year old today, I will be sure to stop back in and share his party soon! Happy Birthday to Jackson! I think four is my favorite age yet. Enjoy the party! Happy birthday to your little man! It’s my daddy’s birthday as well. 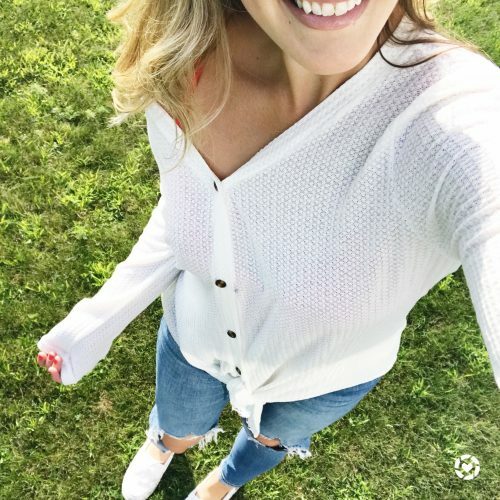 That white top looks so comfy!